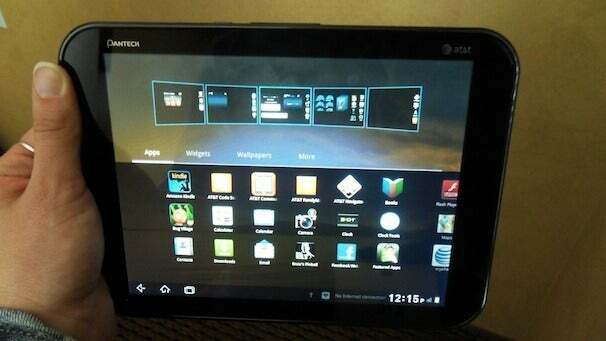 Though it was leaked a few days ago, it was still exciting to see Pantech’s first tablet, the Element, up close and personal. After it was announced at this morning’s AT&T Developer Summit, Pantech showed off its waterproof Honeycomb tablet to a select group of press. AT&T emphasized the concept of “LTE for the masses” and with its $300 price tag, the Pantech Element exemplifies that. The Element might not have the most cutting edge specs, but with a dual-core 1.5GHz Snapdragon processor, LTE speeds, HDMI-out, 1080p video playback and a 5-megapixel camera you get a lot for your money. Oh yeah, and did I mention it is waterproof? You can’t take the Element scuba diving, but it can withstand a good splash or two. Technically, you can submerge the Element one meter into water for up to 30 minutes. This makes the Element even more mobile. Want to watch movies by the pool? No problem, the Element is made for that. The 8-inch Element is in that sweet spot for tablet size; it is small enough to comfortably hold in one hand, but the display is large enough for gaming, video watching and Web browsing. The Element feels a bit on the plasticky side, but not like it is going to fall apart any minute. It is lightweight, too, weighing 16.5 ounces. The Element runs straight Android Honeycomb with no skin or overlay. Pantech confirmed that the Element is in fact upgradeable to Ice Cream Sandwich, but the company has not yet announced any timeline for the upgrade. In my quick hands-on, I found the it to be zippy, especially when Web browsing. The 5MP camera and 2MP front-facing camera had good enough image quality. 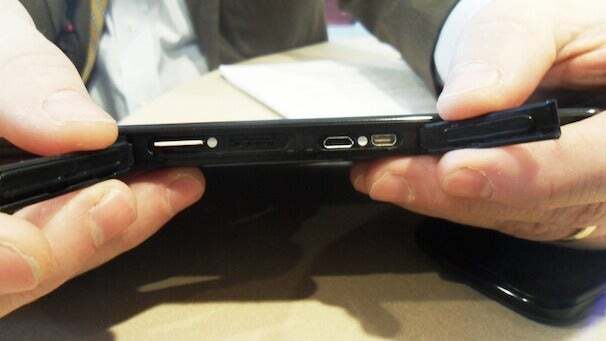 The LCD display is actually made by Pantech so the company had some control over the clarity of the display. Images looked clear, colors looked natural and font was sharp enough. I’m curious to see how the Element’s display does in bright sunlight. What’s the point of using it by the pool if you can’t see the display? The Pantech Element arrives on AT&T January 22 for $300 with a two-year contract. AT&T is also holding a special promotion where you can buy the Pantech Burst Android Smartphone with the Pantech Element and get both for $250.